Fire Dance is a short multi-part story taking place in the same world as Pyrrhic Victory, a few decades before the events of the game. While battles are won and lost and nations are often at war with their neighbours, there is much besides war that happens as well. From the deserts of Slahor to the frigid Wajanderu lands, the lost son of Slahor comes to terms with his gift and his curse. A tale of magic and might as O’in struggles to find both his place and some peace in a world constantly beset by war. Families splinter and new unexpected bonds are formed as nations fight nations and O’in comes to terms with his gift-curse. In the first Chapter, O’in learns of his gift-curse; he is a Firecaster. Sentenced to death by his own father, O’in flees with the help of visiting merchants and his childhood friend Chack. O’in stepped inside a wide circular compound surrounded by a high stone wall. Other doors, like the one he’d just entered from, interrupted the smooth walls. The stone ground was littered by ash that swirled in the eddies created by the wind. Wood lay in piles throughout the arena waiting to be lit for small training bonfires. Zaiya stood next to the largest stack in the middle of the enclosure, one fist clenched as though carrying something. She smirked at O’in as he neared her, “I thought you’d be halfway back to the desert by now. Follow me.” She turned and led him to the smallest wood pile. O’in saw a small flame in her hand before she tipped her cupped palm over allowing the fire to slip into kindling at the bottom of the wood pile. She blew gently on the flames to encourage them to grow and stepped back once they caught. “Do not let the magic Pull you in. Resist any temptation to use your powers,” she said. O’in immediately felt the Pull of the flames, but clenched his fists and jaw to stop himself from reaching out towards them. Zaiya watched him as the sun slowly passed overhead. She threw new logs as needed onto the fire from a large stack nearby until the long shadows of the walls crept towards them. Sweat ran down O’in’s face staining front of his shirt from the effort it took to resist temptation. “O’in, look at me,” Zaiya finally said. “Are we finished for the day?” All O’in wanted to do was sleep. O’in stepped up to the fire and nervously stuck his hand in. He felt a comfortable heat encompass the flesh and tickle his palm. “Close your eyes if you need to. You’ll feel the warmth as it moves up your arm. At first it helps to breathe in as you draw the flames.” Zaiya said. O’in glanced at Zaiya a moment before closing his eyes and concentrated on the feel of the flames against his skin. He took a slow breath in and flexed his fingers at the same time. Feeling the pleasant heat creep up his arm. He smiled to himself as it reached his elbow. “Don’t tell me I can’t,” he interrupted, annoyed, and with that he pulled against the blaze as hard as he could. The fire burst to life, boiling barely beneath the surface. He felt the power inside himself swelling just below his heart and smiled in triumph. “I told you…,” he started, but his concentration failed. Flames rushed out of him through every pore from neck to waist. His clothing vaporized in the sudden surge of heat. Instead of rising, as fire is wont to do, it sank to the dirt floor and spread out quickly in all directions, although tendrils of smoke rose towards the sky. As quickly as they erupted, the flames disappeared into nothing. He stared at Zaiya’s terrified face a moment before sinking to his knees weakly. He looked down at his chest to see angry burns blistering, and, as he watched in horror, bits of his skin turned black. Agonizing pain flared over him and darkened his vision. Just before succumbing to the blackness, he saw a pale Zaiya standing over him, shouting something he couldn’t quite make out. O’in kept his eyes screwed shut as he bit his lip to keep from crying out. The ground beneath him rocked steadily jarring his wounds and making him moan in agony. “He’s awake,” a voice said near him. The rocking stopped with a jolt making him cry out again. “O’in, open your mouth. You must drink some water,” he heard Aldo say gently. He tried to shake his head, but another moan slipped out instead. He clenched his teeth against pain he’d never felt before. It rocked through him in waves. “We have to hurry, Zaiya,” Aldo said, his voice concerned. “We’re still a day away from the physicians at Yi Shae Yu’an Moshu. I worry he won’t last that long.” Aldo looked back to the injured boy laying in the bottom of the wagon bed. Blood stained blankets lay beneath him. He removed the lid from a bucket tied onto the corner, dipped a rag into it, and allowed the cool water to drip over the blood and fluid stained bandages wrapped around O’in’s arms and torso. He dipped the cloth into the water again, wringing it a little to shake loose the excess drippings, then held a corner over the boy’s clenched mouth and squeezed drops of liquid onto his lips. It ran down the cracked skin of his lips and down his cheek. Zaiya nodded and urged the two horses forward. O’in screamed as the wagon jerked to a start before it settled into a rocking gait. When Zaiya lit the fire to prepare dinner that evening, O’in felt the Pull of the flames. His arm lifted of its own accord beckoning towards the campfire, which slowly started to crawl along the ground towards the cart he still lay in causing the dry grass to spark. “Zaiya!” Aldo cried out just before the flames reached the wagon. She rushed to put out the impending grass fire while Aldo jumped into the wagon and, as gently as possible, pulled O’in’s arm down. He stared into the younger man’s eyes and spoke nonsense to pull him away from the temptation until Zaiya could extinguish the campfire and spreading flames. The whites of O’in’s eyes shone brightly in the darkening sky, and his mouth opened in a silent scream. His back arched in pain and the desire to touch flames again while his hands scrambled against the sides of the wagon trying to find purchase to lift himself up. The hunger to use magic consumed him so greatly that the pain in his torso and upper arms lessened. He twisted around struggling against the confinement of his wounds, eyes open wide. O’in could see Aldo and Zaiya watching him in fear as though afraid to touch him. After a few moments he finally collapsed and was as still as death. Aldo and Zaiya rushed to peer over the edge of the wagon in concern, and he noticed relief flooding their eyes at seeing him conscious. The pain returned, although somewhat reduced, and he stared at them. Zaiya turned away covering her mouth with a hand, and Aldo stared at him in disbelief. “You have strength left in you yet, thank the Four Winds.” Aldo said to O’in gently. “Sleep if you can. Your body needs it perhaps more than your mind,” he said before turning to silently spread his blanket beside the wagon. O’in turned his eyes to the stars. A strange calm settled over him as he tried to make out the different constellations above them. Same stars as home, he thought vaguely to himself before sleep finally overtook him. He jerked awake the next morning as the wagon jolted to movement again. He groaned thickly and shifted as the stiffened muscles in his back screamed. His burns still pained him greatly but, strangely, weren’t as intense as the day before. He clenched his teeth to keep from crying out. Aldo changed O’in’s bandages carefully as the wagon rolled on. By the time the new bandages were finally in place, O’in was panting at the effort and tears streaked his cheeks, but he was sitting up with thick blankets supporting him as he leaned against the back of the wagon. The road finally leveled after a steady descent from the mountains. Valleys hidden by the levelness of the land around them would suddenly spread below them as the packed dirt road skirted around the edges and made its way towards the Southern Rupani plains. After a mid-day break, Aldo took over driving the horses, and Zaiya sat in the back with O’in. She looked all around her; everywhere except for O’in’s eyes. “I don’t understand,” Zaiya said, breaking the silence. “What don’t you understand?” Aldo asked. “Pushed,” O’in said in his croaking voice. Aldo turned and he and Zaiya looked at him curiously. Only when the horses pulled the wagon over a small rock on the left shoulder did Aldo turn back around and pull the horses back onto the track. O’in gasped at the sudden movements. “What do you mean,” Aldo asked over his shoulder. “I did-n’t want to burn so…pushed fire…away,” O’in spoke slowly and in stilted sentences to reduce the amount of speaking he needed to do. “Didn’t want to burn you,” he said haltingly. The companions continued onward silently. O’in still leaned against the blankets and hung his head, only groaning occasionally when one of the wheels hit a rock or hole in the road. Just as the sun began to start its Westernly descent in earnest, they topped yet another slight hill that overlooked the largest valley they’d yet seen, Aldo pulled the wagon to a stop. “Finally,” he said in relief. O’in glanced at the valley that spread below them. It was large, though slightly populated, but in the very center stood a strange, tall tower. Progressively smaller spires surrounded it making it seem even larger. The pillars were encircled by small buildings he could only assume were homes and shops. At their current distance they couldn’t make out the population, but tendrils of occasional smoke spoke of their existence. The road continued through the city and out the other side leading to a wide, fast flowing river. Aldo flicked the reins and chirruped the horses onward. 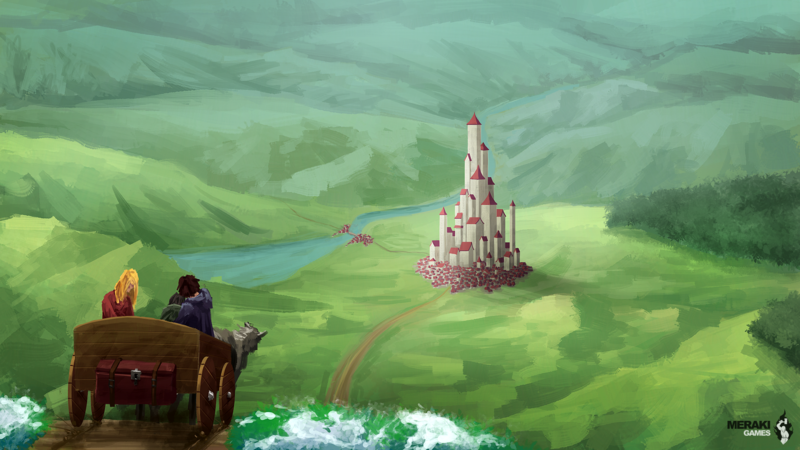 By the time they reached the city gates, O’in had laid back down, weak, tired, and in immense pain from sitting up for too long. The citizens, used to seeing injured people enter the gates, only glanced curiously at the wagon for a brief moment before they continued on with their business. The wagon wound through the wide streets until reaching another tall set of open gates with two guards on either side of it. Aldo halted the cart and spoke to the guard who approached them. He briefly explained what happened to O’in and the urgency of their visit. The guard mounted the wagon bench beside Aldo, and guided them through the gates to a wide door set into the side of the tallest tower. The guard jumped off the wagon before it came to a full stop and ran inside. “Where are we,” O’in asked, his voice a quiet croak. The guard returned with two more men carrying a litter. Zaiya jumped out of the wagon bed while the men climbed in setting the litter next to O’in. They gently helped him lay on it before lifting it up and carrying him inside while Zaiya and Aldo trailed behind.